When it comes to winter, picking out a winter jacket might be one of the most important items on your to-do list. That is if you’re living in Canada like me or somewhere else with minus degree weather. However, if you’re in California, you can still enjoy the photos! Last year, I was introduced to Noize – a jacket company that develops unique collections season after season with a focus on high-quality faux fur and vegan leather accents. 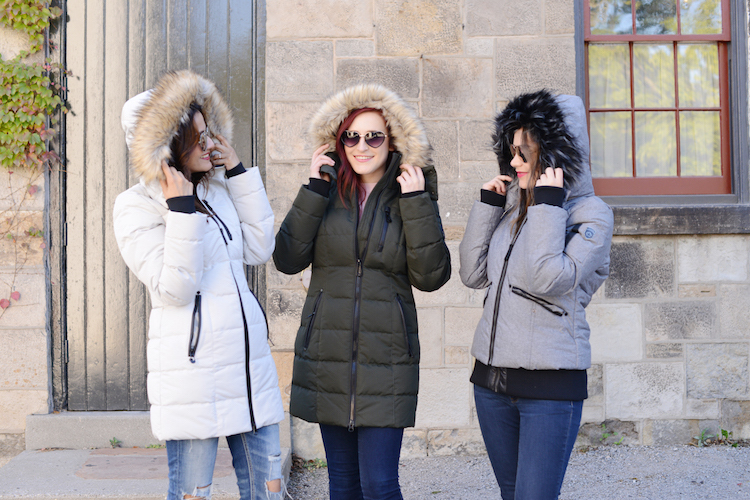 Each piece makes a statement embracing an unrivalled selection of warm and fashionable outerwear! You might remember some of my Noize outfit posts: Noize Burgandy Coat Outfit and White Fur Coat Outfit. When purchasing a winter jacket the first question you should ask is “Where will I be wearing this jacket?” Are you looking for something that you can wear for quick outings to the mall or maybe a jacket that will keep you warm on a ski hill? If the first option sounds like you I would opt for a short jacket as it will be lighter but just as warm. The Noize Maple Bombers are a perfect choice. If you’re looking for a jacket that will be good for winter activities, definitely opt for a longer type jacket. The longer jackets like the Noize Hannah as so nice as they cover your bum, keeping your thighs and bum warm! If the winter winds bother you the most, I highly recommend the Noize Gigi Jacket – the Faux Fur Hood Trim helps to block it all out! I know from experience – my White Noize Jacket with the hood trim saved me last year. This year I opted for a shorter jacket in grey – The Maple Bomber in Grey. I wanted something that was easy to wear for every winter outing like running to the grocery store but was still warm enough for other winter activities. Probably one of my favourite feature of the Noize jackets is the fleece lined pockets. I can’t count how many times I forget my mitts so the fleece definitely helps. I think I might need to get a pair of mitts that have the string attached. Shop all the Noize Jackets here. Special thanks to Noize for sponsoring this post. As always, all opinions are my own.